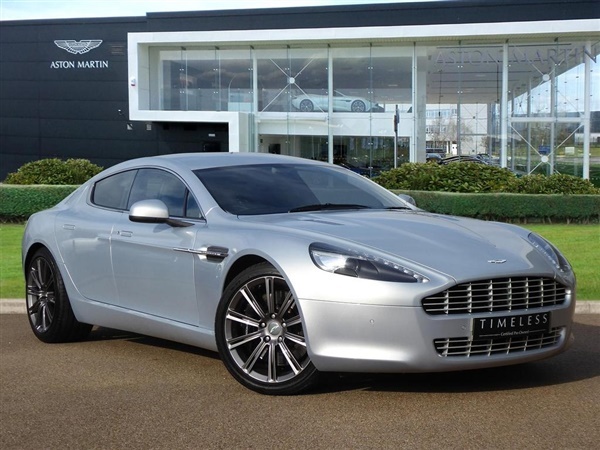 Lightning Silver, NATIONWIDE DELIVERY AVAILABLE This is a stunning Rapide with 20- Spoke Alloy Wheels with Graphite Finish, Garage Door Opener, Piano Black Facia Trim and Sports Seats. WE WELCOME PART EXCHANGES. PLEASE CALL OR VISIT OUR WEB SITE *** FOR FURTHER INFORMATION, Upgrades - 20- Spoke Alloy Wheel - Graphite Finish, Garage Door Opener, Facia Trim - Piano Black, Sports Seat, Service History, Standard Features - 1000W Bang & Olufsen Beosound Audiosystem, 20'' alloy wheels - 20-spoke design, 6 CD autochanger with MP3 device audio connection, Adaptive Damping System, Alarm and immobiliser, Aluminium, magnesium alloy and composite body, Auto-dimming rear view mirror, Automatic front and rear temperature control, Bluetooth telephone preparation, Cruise control, Dual Cast disc brakes with ABS, Dual stage driver and passenger front airbags, Dynamic stability control (DSC), Electrically operated front seats, Electronic Park Brake (EPB), Electronic brakeforce distribution (EBD), Emergency brake assist, Four-door body style with tailgate and 4 individual seats, Front and Rear parking sensors, Front occupant side airbags, Full leather interior, Hard Disc Satellite navigation system, Head protection airbags for front and rear occupants, Heated front and rear seats, Heated rear screen, Hydraulic brake assist (HBA), Memory front seats and exterior mirrors, Powerfold mirrors, Trip computer. 4 seats, All our vehicles come HPI checked & clear. We offer competitive finance quotes, get in touch today!